"Hey. For what it's worth, I've got a good feeling about this." The Star Wars™ Roleplaying Game is the perfect way to play out your own adventures in the Star Wars universe from the comfort of your own table. From the scoundrels and outlaws of Edge of the Empire® to the soldiers and tacticians of Age of Rebellion® to the mystical Force users of Force and Destiny®, every corner of the Star Wars galaxy is yours to explore. With the recent release of the Dawn of Rebellion sourcebook, available now from your local retailer or our website, it's easier than ever to run a game set in the early days of the Rebellion—the exact period chronicled by Star Wars Rebels. Today, guest writer Bryan Young gives us a taste of what's possible in this era by examining just how you could turn an episode of Star Wars Rebels into a session of the Star Wars Roleplaying Game! Bryan Young: Who hasn’t watched an episode of Star Wars Rebels and thought the scenario would be amazing fun for the Star Wars Roleplaying Game? Well, what if I made it really easy for you? I’ll give you everything you need to run your group through an episode. Obviously, you’ll be able to scale it for your players and their particular quirks, but Rebels makes it easy to create a game on the fly. Let’s start with the fifteenth episode of season two, “The Call.” In this episode, the Rebels are running low on fuel, as they always seem to be, and they need to steal some from an asteroid-based gas refinery. It’s the perfect sort of setting for a one-shot adventure, because of its remote location. And you can easily scale the difficulty based on how many players you have. In the episode, the mining guild has its own, brightly painted, TIE fighters that help defend the base from attacks by rogues just like your heroes. That means your players are going to have to find a way to get to the base without crashing into any of the pools of unrefined fuel. Just watching the episode will help you visualize exactly what the facility looks like and give you an edge in describing it for your players. Your characters may not even know the exact location of the refinery… or maybe they have to quietly tail the patrol of TIEs to the base? Your players can come up with any number of plans to get to the landing platforms, ranging from bluffing their way down to shooting the place up. Regardless of how they decide to do it, there is still going to be security at the installation. The security can range in species from Rodians or Trandoshans to Aqualish and Togruta, but for the sake of this adventure, why don’t we say the whole thing is guarded and operated by Humans and Rodians. In the episode, some of the guards had access to an E-Web heavy repeating blaster cannon, which certainly made things more difficult for our heroes. That's just another thing that you can make available to your NPCs, depending on how difficult you’re planning on making this encounter for your players. How the security forces at the installment make themselves known is really dependent on how your players make it down to the platform. If they’ve started shooting, then maybe a mob of guards and the E-Web are already waiting for them. If they’ve bluffed their approach, perhaps there is only one or two guards on the platform that they need to get through. In the episode, the Ghost is able to refuel right there on the platform, while the other members of the team cover them… but there are plenty of other ways the fuel could be stolen, too. And what if your characters need a lot more than just fueling up a single ship? There’s every chance they could sneak inside the refinery and steal pallets of even more fuel to bring back to the Rebellion. Another aspect of this particular episode of Star Wars Rebels is the inclusion of the purrgills. These are giant space whales capable of hyperspace travel. They consume the unrefined gas in order to power their organic jumps. Hera explains that spacers find them to be a nuisance and a threat that can destroy ships, which is why they should be shot at and scared away or killed. Ezra doesn’t feel the same way and connects with them. How you handle the purrgills in your game (if at all) can vary between those two extremes, but whichever way your players react, you’ll need to make sure the purrgills are consequential. During the Ghost’s escape, the Mining Guild deploys even more guards and TIE fighters to pursue them on their way out. In the episode, the purrgills are the key to the Ghost getting back to safety, but your characters will, naturally, improvise any way they see fit! They might be able to shoot their way out on their own, or come up with an even more inventive solution. Taking episodes of Star Wars television shows, especially Rebels, make perfect fodder for adventures in your roleplaying games at home. There’s no better inspiration for Star Wars adventures than to roleplay with Star Wars itself. 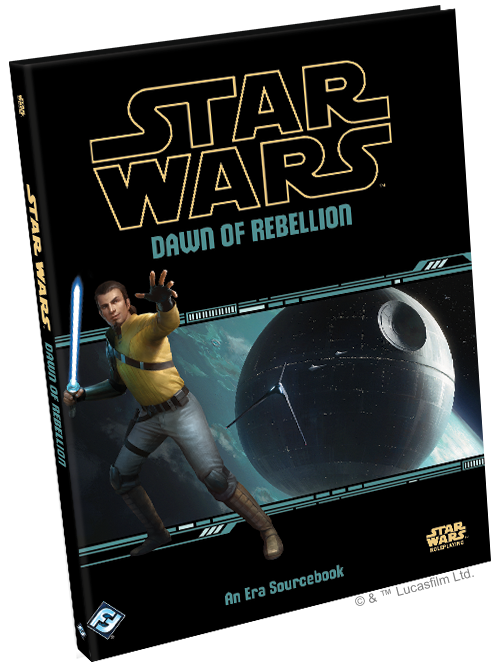 Become a Rebel with Dawn of Rebellion (SWR10), available now from your local retailer or our website! Participate in grim and gritty adventures on the fringes of the Star Wars universe with Star Wars®: Edge of the Empire™. Edge of the Empire is a complete standalone roleplay system that transports players to some of the shadiest locations in the Outer Rim, the underbelly of the Core Worlds, and everywhere else in-between! © and ™ Lucasfilm Ltd.